Extollo's LANPlug 2000 Powerline G.hn MIMO compliant adapters create a self-contained, secure home network using the existing electrical wiring within the home to turn every electrical outlet into an Internet access port. Simply pair the units with the pairing button and they are ready to go! Quickly and intuitively create a multimedia home network to share residential Internet access among all Internet capable devices within the home. Sold as a single unit, the box includes 1 x LANPlug 2000, 1 x 6ft Ethernet cable and a quick start guide. Product manual is available on Extollo Communications website. NOTE: This is not a wireless product. Performance will vary depending on the age of your electrical home wiring, distance between the LANPlug 2000's, noise on the powerlines and if the powerline signal has to go from electrical phase 1 to electrical phase 2. New Powerline adapter from Extollo using the latest and fastest G.hn Powerline standard. NOT COMPATIBLE WITH THE "LANSocket 1500". 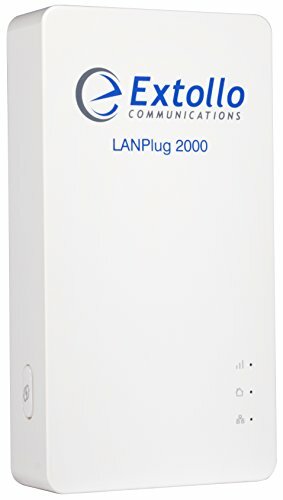 2 x LANPlug 2000's are required to create a Powerline network. Ultra fast with world class Powerline performance, out performs its rivals. 2x2 MIMO with beamforming increase the LANPlug 2000's network range while providing multiple simultaneous connections. High Performance & low latency, makes it ideal for streaming 4K/UHD video and multiplayer online gaming. Plug and Play installation, Gigabit Ethernet connection, Compatible with Una for Wi-Fi extension.